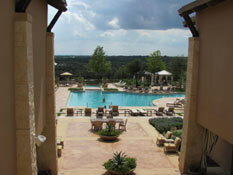 Just north of San Antonio is one of the best resorts in Texas. It's a very impressive resort, loaded with amenities, and it gives you access to two of the best golf courses in Texas - the new PGA Tour TPC AT&T Oaks and AT&T Canyons Golf Courses. We were impressed and excited as we approached this magnificent resort and got a glimpse of one of the golf holes and the resort perched on a bluff on 600 picturesque acres of rolling Texas Hill Country just north of downtown San Antonio. The JW Marriott is huge with 1002 rooms and 85 suites - making it the largest JW Marriott in the world yet it has a rare Hill Country character, a small and intimate feel, and personalized Texas friendly hospitality coupled with excellent service. It just doesn't get much better than that! 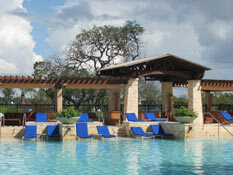 And they have a variety of Stay & Play packages and options for golfers. Before you leave check out the various stay options on the . Head out the front door of the JW Marriott and within a couple minutes you're at the pro shop for two PGA Tour 18 hole Tournament Player's Club golf courses. And it just doesn't get much better than the TPC AT&T Oaks and TPC AT&T Canyons courses, which are only available for play by the pros, members, or resort guests. When we stayed, we played both courses - what a fantastic experience and both courses made our Favorite Texas Courses list. Don't let the challenges of either the AT&T Canyons or the AT&T Oaks Course discourage you from playing it and don't try to be too macho, move up a set of tee boxes, keep the driver in the bag on some holes, and you'll love both of these courses. 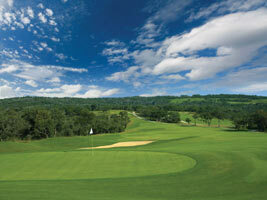 Both courses offer near perfect conditions, first class service, and excellent practice facilities. The GPS system is one of the best and has yardages, fly overs, tips, and the commentary on the Oaks course is from Greg Norman. All of the staff from the pro shop to the starters to the cart ladies are friendly, helpful, and want to make sure you have a fun and memorable round. 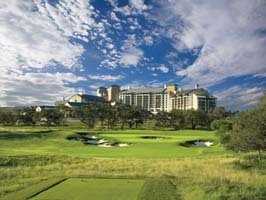 Both courses made our Top 25 Texas Courses List. The pro shop is very well stocked with everything that you need. And make sure you spend a lot of time on the range, putting green, and bunkers - you'll need your "A" game to score well on either course. The deck of 18 Oaks, which is next to the pro shop, is the perfect place to end your round with a cold drink, an appetizer, or some good food. The seven story JW Marriott has a good mix of suites and hotel rooms half of which will have majestic views of the hill country, golf course, or water park. During our Stay & Play, we were on the ground floor in a standard room with a sliding glass door that opened to a small patio with two chairs and a table - perfect for us. We could walk out the sliding glass door and in less than a minute we could be floating down the lazy river, catching a score at the High Velocity Sports Bar, or be eating dinner on the patio of the Cibolo Moon restaurant. And the pro shop was a two minute walk from our room - after our first round, we had our clubs stored in the locker room for the next day's round - how easy is that! The patio was also great for a cup of coffee in the morning and a drink and round of dominos in the evening. I toured one of the suites and they are fantastic! The one I saw had two adjoining rooms, a huge patio with great patio furniture and a magnificent view, a well appointed large living area with upscale furniture and a murphy bed. What a perfect place to stay with your golfing buddies, friends, or family! 18 Oaks - overlooking the 18th hole of the TPC AT&T Oaks course, 18 Oaks offers fine dining at the Club House showcasing prime cuts of traditional steakhouse fare, the freshest of seafood, numerous cuts of locally sourced meats, and a la carte sides. After a fantastic round of golf, we had lunch on the veranda overlooking a hole that ate 3 of my golf balls and to get even I devoured the best chicken pot pie (with a buttermilk biscuit crust) that I've ever had. Plus I sampled a delicious Gulf Shrimp Bisque and French Onion soup, a Gulf Crab Slider on a baby brioche bun, an iron charred Meyers natural hanger steak with fries, and a pulled chicken Caesar salad! Excellent - mymouth is watering just thinking about it! And the view is majestic. 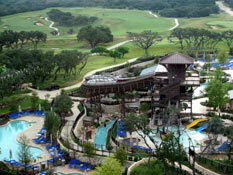 The JW Marriott Resort & Spa is 17 miles from downtown San Antonio which is loaded with fun things to see and do. And the San Antonio area is home to some outstanding golf courses - use this San Antonio Golf Map to quickly locate a course and read our review of the course. Use this San Antonio Map to find amusement parks (Sea World, Six Flag's Fiesta Texas, Schlitterbahn Waterpark), attractions (Riverwalk, San Antonio Museum or Zoo, Alamo, and lots more), shopping, wineries, and more.